Jurnee Smollett. 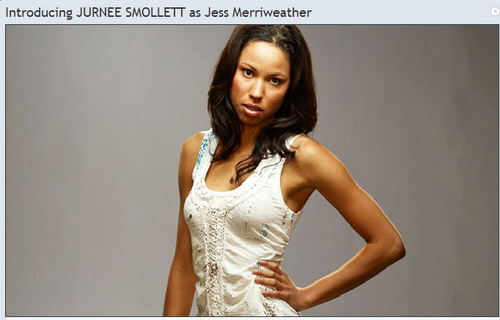 Season 4 promotional 이미지 of Jurnee Smollett as Jess Merriweather. Wallpaper and background images in the Friday Night Lights club tagged: friday night lights season 4 promo promotional jurnee smollett jess merriweather. This Friday Night Lights photo might contain 저녁 식사 드레스, 저녁 드레스, 정장, 이브닝 가운, 저녁 가운, 공식적인, 칵테일 드레스, 시스, 칼집, 칼 집, 끈, 맨 손으로 어깨, 끈이없는, 맨손으로 어깨, and 끈이 없는.